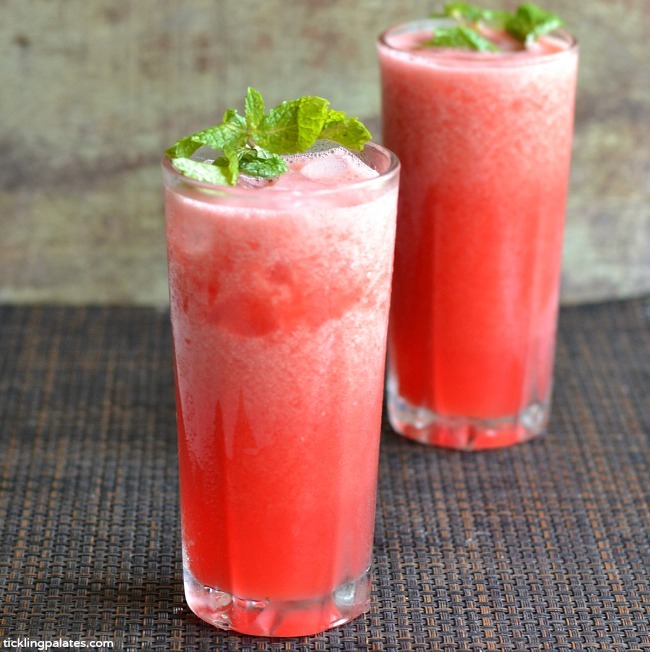 Watermelon Slushies are the best way to enjoy the fruit during summer when the sun can be so relentless in sapping out your strength. Astonishingly refreshing and chilling at the same time. These won’t have the creamy goodness of the Cantaloupe Slushies but will definitely quench your thirst and help you beat the heat in style. 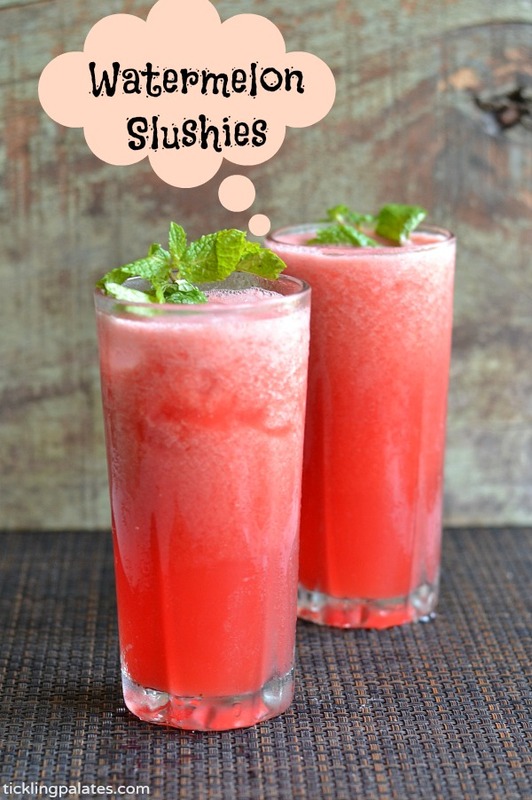 I wanted to make a granita but the repetition of freezing and poking the frozen juice slab made me think twice and these watermelon slushies can easily be called as the closest sister to Granita. It entails less work but gives you the satisfaction of having enjoyed a granita at a much lesser time without all the time and effort that goes into making one. This drink will almost be like eating and drinking a flavoured fruit popsicle at the same time. And both the kids and adults will enjoy them thoroughly. Make sure that you adjust the sugar quantity according to your taste buds and do not miss out on the lemon juice and it enhances the taste. 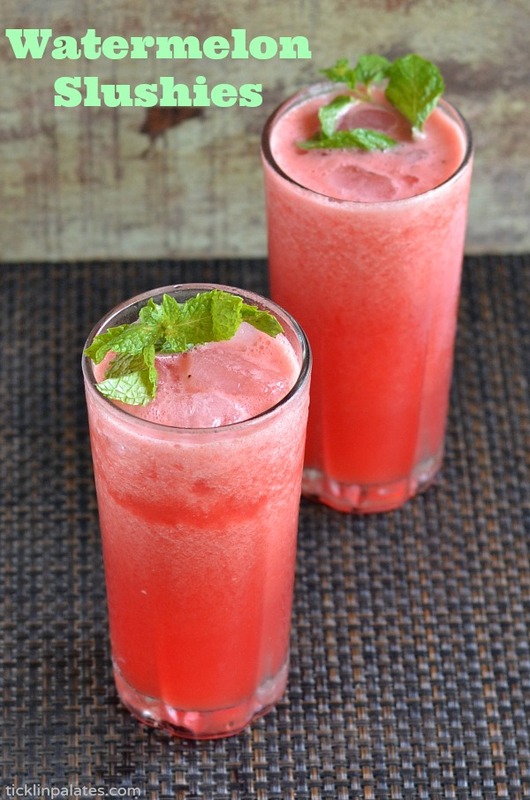 Watermelon Slushies to beat the summer heat with style. Place sugar in the blender and powder it first. Add watermelon, ice cubes and the juice squeezed from the lemon and blend well. Pour into tall glasses and place the mint sprigs on top. Delicious! Perfect drink for summer..
it looks like a great summer drink! Looks fabulous, but if it ever warms up here enough to have a watermelon slushy, I’ll celebrate by adding just a bit of gin to mine!